Malaria is an infectious disease caused by a microscopic parasite called Plasmodium, which is transferred between humans by mosquitos. One species of malaria parasite called Plasmodium falciparum can cause particularly severe and life-threatening forms of the disease. Currently, the most widely used treatment for P. falciparum infections is artemisinin combination therapy, a treatment that combines the drug artemisinin (or a closely related molecule) with another antimalarial drug. However, resistance to artemisinin has started to spread throughout Southeast Asia. Artemisinin resistance is caused by mutations in a parasite gene called kelch13, and researchers have identified over 20 different mutations in P. falciparum that confer artemisinin resistance. The diversity of mutations involved, and the fact that the same mutation can arise independently in different locations, make it difficult to track the spread of resistance using conventional molecular marker approaches. Here, Amato, Miotto et al. sequenced the entire genomes of more than 3,000 clinical samples of P. falciparum from Southeast Asia and Africa, collected as part of a global network of research groups called the MalariaGEN Plasmodium falciparum Community Project. Amato, Miotto et al. found that African parasites had independently acquired many of the same kelch13 mutations that are known to cause resistance to artemisinin in Southeast Asia. However the kelch13 mutations seen in Africa remained at low levels in the parasite population, and appeared to be under much less pressure for evolutionary selection than those found in Southeast Asia. 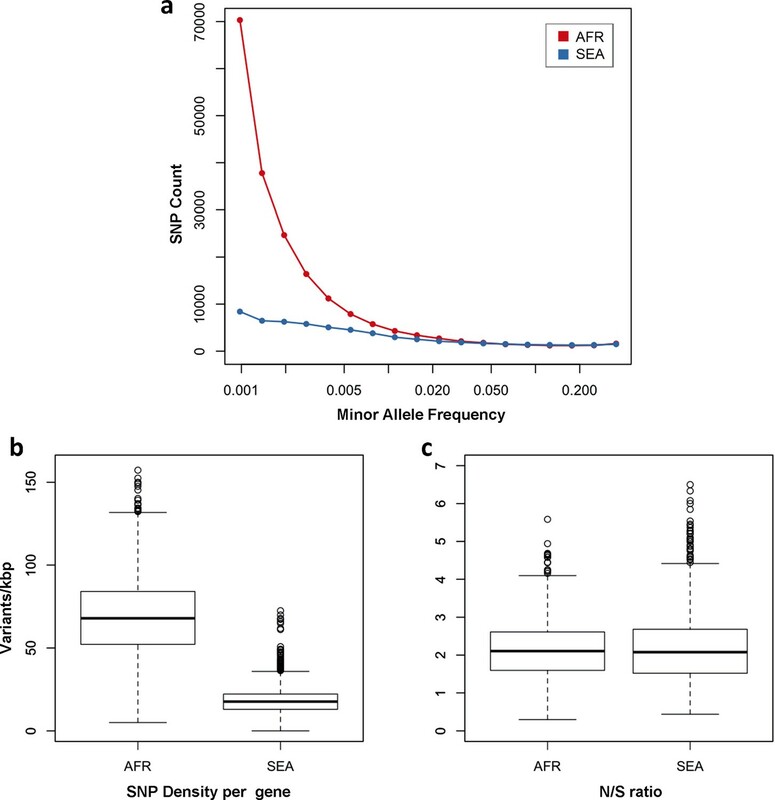 These findings demonstrate that the emergence and spread of resistance to antimalarial drugs does not depend solely on the mutational process, but also on other factors that influence whether the mutations will spread in the population. Understanding how this is affected by different patterns of drug treatments and other environmental conditions will be important in developing more effective strategies for combating malaria. Artemisinin combination therapy (ACT), the frontline treatment for P. falciparum infection, has played a major part in reducing the number of deaths due to malaria over the past decade (World Health Organization, 2014b). However the increasing prevalence of artemisinin resistant P. falciparum across large parts of Southeast Asia threatens to destabilise malaria control worldwide (Dondorp et al., 2009; Hien et al., 2012; Phyo et al., 2012; Kyaw et al., 2013; Ashley et al., 2014; World Health Organization, 2014a). One of the main contemporary challenges in global health is to prevent artemisinin resistance from becoming established in Africa, where the consequences for childhood mortality could be disastrous (Dondorp and Ringwald, 2013). Understanding the epidemiological and evolutionary driving forces behind artemisinin resistance is essential to develop effective strategies to stop it spreading. At the molecular level, artemisinin resistance is caused by mutations in a kelch protein encoded by PF3D7_1343700 on P. falciparum chromosome 13, referred to here as kelch13. 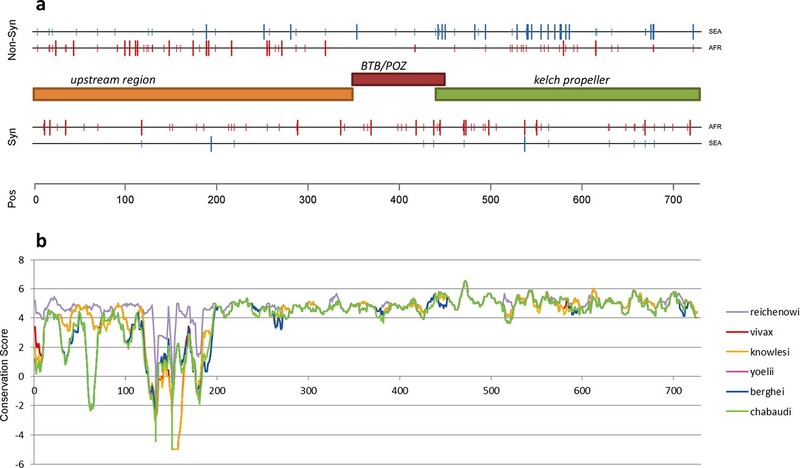 More specifically, non-synonymous mutations in the kelch13 propeller and BTB-POZ domains (KPBD) result in reduced sensitivity of P. falciparum to artemisinin, as demonstrated by multiple lines of evidence including laboratory studies of artificially acquired resistance, genetic association studies of natural resistance and allelic replacement experiments (Ariey et al., 2014; Ghorbal et al., 2014; Miotto et al., 2015; Straimer et al., 2015; Takala-Harrison et al., 2015). Parasites with KBPD mutations tend to grow more slowly in the early part of the erythrocytic cycle, and have an enhanced unfolded protein response, both of which might act to protect against oxidative damage caused by artemisinin (Dogovski et al., 2015; Mok et al., 2015). It has also recently been shown that the PI3K protein is the target of artemisinin action, and that kelch13 binds to PI3K to mark it for degradation; by affecting this binding, KBPD mutations result in high levels of PI3K which counteract the effect of artemisinin (Mbengue et al., 2015). A striking characteristic of the current distribution of artemisinin resistance is that it is caused by multiple independent KPBD mutations emerging in different locations, i.e. it does not originate from a single mutational event. More than 20 KPBD SNPs have been associated with delayed parasite clearance during artemisinin treatment and there are several documented instances of the same allele arising independently in different locations (Ashley et al., 2014; Miotto et al., 2015; Takala-Harrison et al., 2015). These are classic features of a soft selective sweep which, according to evolutionary theory, is most likely to arise in populations where the selected alleles are already present as standing genetic variations or have been repeatedly introduced by de novo mutations (Hermisson and Pennings, 2005; Pennings and Hermisson, 2006; Messer and Petrov, 2013). There is ongoing debate among evolutionary biologists about how commonly soft selective sweeps occur in nature (Jensen, 2014; Garud et al., 2015) but they have clearly played a role in previous forms of antimalarial drug resistance (Nair et al., 2007; Salgueiro et al., 2010) and the current epidemic of artemisinin resistance is the most extreme example of a soft selective sweep thus far observed in eukaryotes. This creates a practical problem in monitoring the global spread of resistance. Artemisinin resistance can be measured directly, by following the rate of parasite clearance in patients (Flegg et al., 2011) or by testing parasite isolates in vitro (Witkowski et al., 2013), but these phenotypic assays are resource intensive and impractical for large-scale screening in resource-poor settings. Genetic approaches are therefore preferable for practical implementation of large-scale surveillance, but the soft selective sweep of artemisinin resistance produces much more heterogeneous genetic signatures than previous global waves of chloroquine and pyrimethamine resistance, where hard selective sweeps were the dominant mode of spread. Thus there is considerable uncertainty about the epidemiological significance of the growing number of non-synonymous KPBD mutations reported in Africa (Ashley et al., 2014; Hopkins Sibley, 2015; Kamau et al., 2015; Taylor et al., 2015). Previous studies in Africa have not identified variants known to cause resistance in Southeast Asia (Kamau et al., 2015; Taylor et al., 2015). At the same time, there are documented instances of African parasites that can be rapidly cleared by artemisinin treatment, although they carry KPBD mutations (Ashley et al., 2014). In the absence of comprehensive phenotypic data, it is not known which of these mutations, if any, are markers of resistance. This is a limitation of conventional molecular epidemiology, which tracks specific mutations and haplotypes and is poorly equipped to monitor soft selective sweeps where new mutations are continually arising on different haplotypic backgrounds, making it difficult to keep track of their phenotypic effects and evolutionary trajectories. Here we explore how genomic data might help overcome these practical obstacles to monitoring the current epidemic of artemisinin resistance. This analysis includes genome sequencing data for 3,411 clinical samples of P. falciparum obtained from 43 locations in 23 countries. This large dataset was generated by the MalariaGEN Plasmodium falciparum Community Project, (www.malariagen.net/projects/parasite/pf), a collaborative study in which multiple research groups working on different scientific questions are sharing genome variation data to generate an integrated view of polymorphism in the global parasite population. Data resources arising from the present analysis, including genotype calls and sample metadata, can be obtained at www.malariagen.net/resource/16. The MalariaGEN Plasmodium falciparum Community Project also developed a user-friendly web application, with interactive tools for exploring and querying the latest version of the data: www.malariagen.net/apps/pf. Paired-end sequence reads were generated using the Illumina platform and aligned to the P. falciparum 3D7 reference genome, applying a series of quality control filters as previously described (see Materials and methods) (Manske et al., 2012; Miotto et al., 2013). The initial alignments identified 4,305,957 potential SNPs, which after quality control filtering produced a set of 935,601 exonic SNPs that could be genotyped with high confidence in the majority of samples, and that form the basis for the current analysis. As summarised in Table 1, the dataset comprised 1,648 samples from Africa and 1,599 samples from Southeast Asia, allowing us to compare these two groups directly without the need for sample size corrections. We identified a total of 155 SNPs in the kelch13 gene, of which 128 were seen in Africa and 62 in Southeast Asia (Table 2). Studies in Southeast Asia have found that artemisinin resistance is associated with non-synonymous polymorphisms in the KPBD. Out of a total of 46 non-synonymous SNPs in these domains we found a similar number in Africa (n = 26) and Southeast Asia (n = 34), with 14 seen in both places (Table 3). Seven of those observed in Africa have previously been associated with artemisinin resistance in Southeast Asia, including C580Y, the most common allele in resistant parasites (Miotto et al., 2015). Count of samples analysed in this study. Worldwide distribution of kelch13 mutations. Number of kelch13 propeller and BTB-POZ domain (KPBD) mutations present (not necessarily exclusively) in 5 populations (AFR = Africa, SEA = Southeast Asia, SAS = South Asia, OCE = Oceania, SAM = South America). Sample size is reported for each population. List of non-synonymous KPBD mutations. Non-synonymous mutations found in the kelch13 propeller and BTB-POZ domains (KPBD) and their position on chromosome Pf3D7_13_v3. For each mutation is reported where it has been observed and in how many samples. Where known, we reported if the mutation has been previously observed in patients with a prolonged parasite clearance half-life (>5 hr) by Miotto et al. 2014 and/or Ashley et al 2014. Sample size is reported for each population. We asked whether kelch13 polymorphisms seen in Africa had emerged independently, as opposed to migrating from Southeast Asia. We started by grouping samples according to genome-wide genetic similarity, based on a neighbour-joining (NJ) tree (Figure 1A). African and Southeast Asian samples formed two well-separated and distinct clusters, suggesting that gene flow between the two regions is very modest or negligible, a view supported by an alternative analysis using principal coordinate analysis (Figure 1B). None of the African parasites carrying kelch13 mutations grouped with the Southeast Asian population, supporting the idea that these mutations are indigenous. Differentiation between African and Asian genomes. (A) Neighbour-joining tree showing population structure across all sampling sites, with sample branches coloured according to country groupings (Table 1). Branches with large open tip circle indicate the sample is a kelch13 mutant, while those with a small black symbol are mixed infections (i.e. mixture of wild-type and mutant parasites or two mutant parasites with different mutations). Branches without tip symbols are kelch13 wild type. African kelch13 mutants are, at a genomic level, similar to other African samples. (B) Plot of second principal component (PC2) against the first (PC1), computed from a principal coordinate analysis (PCoA) of all samples in the present study, based on the same pairwise genetic distance matrix used for the tree of Figure 1A. PC1 clearly separates African samples from those collected in SEA, while PC2 is mainly driven by extreme population structure in ESEA. We considered that recombination between African and imported parasites could result in the transfer of DNA segments of Asian origin into genomes that otherwise appear to be local, and therefore not be easily detectable through genome-wide analysis. Thus, we analyzed the regions immediately flanking kelch13 in both directions, using a probabilistic method to reconstruct the most likely geographical origin of haplotypes observed in African kelch13 mutants (Figure 2). The vast majority of kelch13 mutants showed no evidence that flanking regions may have been imported, which indicates that most mutations observed in Africa do not have a common origin with those in Asia, and are likely to have emerged independently on a variety of haplotypes (Figure 2—figure supplement 1). Local origin of African kelch13 mutations. (A) Chromosome painting (see Materials and methods) of the 52 African kelch13 mutants across the two 250 kbp flanking regions on each side of the kelch13 gene. Each genome chunk is coloured according to the aggregated posterior probabilities that it originated in the African (red) or SEA (blue) population, according to the scale shown. (B) Detail of the flanking regions over a span of approximately 15 kbp, using the same colour scheme. The country of origin is indicated on the left, followed by the proportion of African chunks identified; the kelch13 mutation carried by the sample is shown on the right. Samples are sorted by the proportion of Asian chunks in this window, and the same order was applied to Panel A. Only five samples (lower region of the panel) show strong probability of Asian origin of the chunks closest to kelch13. Only 5 samples out of 56 were assigned a significant probability of Southeast Asian origin in at least one flanking sequence, and only two of these samples carried haplotypes similar to those in SEA mutants (Figure 2—figure supplement 2). Both in the NJ tree and in the PCA, these two African kelch13 mutants do not cluster with the bulk of African samples, but occupy a somewhat isolated position (Figure 1). We note that they exhibit unusually high levels of heterozygosity (FWS < 0.4), with mixed calls randomly distributed across the genome, consistent with a mix of African and SEA parasites. Continuous genetic monitoring of the parasite population will determine whether these are indeed just isolated cases, or they constitute very early evidence of gene flow between the two regions. Since these samples passed through a number of different laboratories, we cannot absolutely rule out the possibility that these mixtures could be the result of biological contamination during sample preparation and processing. Historical demographic changes such as population expansions and bottlenecks (Tanabe et al., 2010), and epidemiological and environmental factors (Prugnolle et al., 2010) are highly influential forces that shaped the allele frequency spectra of P. falciparum populations across the globe (Nielsen et al., 2009; Manske et al., 2012). In order to properly contextualize the numbers and frequencies of kelch13 mutations, it is therefore important to characterize genomic variation patterns in different geographical regions. One of the most striking features of this dataset is the high number of rare variations in the high-quality SNP list. At more than half of all polymorphic sites, the minor allele was only carried by a single sample (referred to as singletons, n = 330,783 or 35%) or by two samples (doubletons, n = 214,179 or 23%), often in heterozygous calls. By contrast, only 13,383 polymorphisms (1.4%) had a minor allele in ≥5% of samples. Rare alleles, however, are not evenly distributed geographically. There is a large excess of polymorphisms with minor allele frequency (MAF) below 0.1% in Africa (71% of all SNPs, vs. 17% in SEA), while numbers in the two regions are similar for SNPs with MAF>1% (2% of all SNPs, Figure 3a). Rare variations in Africa are not confined to a limited set of highly variable genes, but evenly distributed across the genome, as attested by the distribution of variants across all genes: SNP density in Africa (median = 67 SNPs/kbp, interquartile range = 51–84) is approximately 3.9 times higher than in SEA (median = 17, IQR = 13–22, p < 10–16, Figure 3b). Very similar ratios are estimated in both non-synonymous (Africa median SNP density = 43, IQR = 27–58; SEA median = 11, IQR = 7–15) and synonymous variants (Africa median SNP density=25, IQR = 20–30, SEA median = 6, IQR = 4–8). Accordingly, we found virtually identical distributions of the ratio of non-synonymous to synonymous mutations (N/S ratio) in the two regions (Figure 3c). This suggests that the huge disparity in SNP density between the two regions is more likely to be the result of different demographic histories and epidemiological characteristics, such as changes in effective population size (Joy et al., 2003), rather than the product of different selective constraints. Number and density of variants in Africa and Southeast Asia. (a) Allele frequency spectrum for Africa (red) and SEA (blue). Polymorphisms were binned by their minor allele frequency (MAF), and the counts in each bin were plotted against frequency, shown on a logarithmic scale. Although the number of high-frequency variations is consistent between the two regions, samples from Africa possess an excess of low-frequency variations. (b) SNP density per gene: for each gene, the number of variants found in the two regions is normalized by the length of the coding region (in kbp). African samples have on average 3.9 times more mutations than parasites from SEA. (c) Non-synonymous/synonymous ratio per gene: ratios of non-synonymous to synonymous mutations found per gene are similar in the two regions. To reduce artifacts due to small numbers, only genes with at least 10 SNP were considered in both analyses. In summary, we observe many more rare variants in Africa than in SEA; however we expect N/S ratios to be similar in these two regions in genes that are not subjected to selective pressures. The density of kelch13 synonymous variations in the two continents is roughly consistent with that observed in the rest of the genome (Africa: 28 SNPs/kbp, SEA: 6; Figure 4a), which is expected since synonymous changes are less likely to be affected by selection. The excess of African non-synonymous mutations in the upstream region is also consistent with expectations (Africa: 44 SNPs/kbp, SEA: 16). In contrast, non-synonymous polymorphisms in the KPBD show a reversal of this relationship: SEA parasites possess about 30% more polymorphisms than African ones (34 in SEA vs. 26 in AFR). In addition, all but two non-synonymous changes in the KPBD are observed in Africa at very low frequency (singletons and doubletons), while in SEA more than half of the changes are observed in >2 samples (Table 4 and Figure 3—figure supplement 1). Structure of kelch13, positioning of mutations in Africa and Southeast Asia, and sequence conservation. (a) The amino acid positions of kelch13 polymorphisms observed in Africa (red) and SEA (blue) are shown. Coloured rectangles describe the extents of the resistance domains (BTB/POZ: aa. 349–448; kelch propeller: aa. 443–721) and upstream region, with the locations of non-synonymous changes indicated above, and that of synonymous changes below. Short lines represent singleton/doubleton mutations, while longer lines represent more frequent mutations. (b) Conservation score across amino acid residues of kelch13, derived by applying a CCF53P62 matrix on alignments of the P. falciparum gene coding sequence with its homologues in six other Plasmodium species for which high-quality sequence data were available: P. reichenowi, P. vivax, P. knowlesi, P. yoelii, P. berghei, and P. chabaudi (see Materials and methods). Although the region below position 200 is less conserved, particularly in rodent species (P. yoelii, berghei, and chabaudi), there is remarkably high conservation across all species over the rest of the gene, which includes the KPBD. Frequency of the non-synonymous KPBD mutations. Counts of non-synonymous mutations in the conserved propeller and BTB-POZ domains of kelch13 are shown for each geographical region, stratified by the number of samples in which they are observed. Sample size for each population is reported. At a first approximation, these observations are consistent with a high number of non-synonymous changes that have risen in frequency in SEA parasites because of their association with artemisinin resistance, and a low number of mostly rare alleles in Africa, where artemisinin has been introduced more recently and resistance is yet to be reported. Although the function of kelch13 is as yet unclear, an alignment of its homologous gene sequences in eight Plasmodium species shows that the propeller and BTB-POZ domains are part of a highly conserved region (Figure 4b), suggesting a crucial role in parasite fitness. 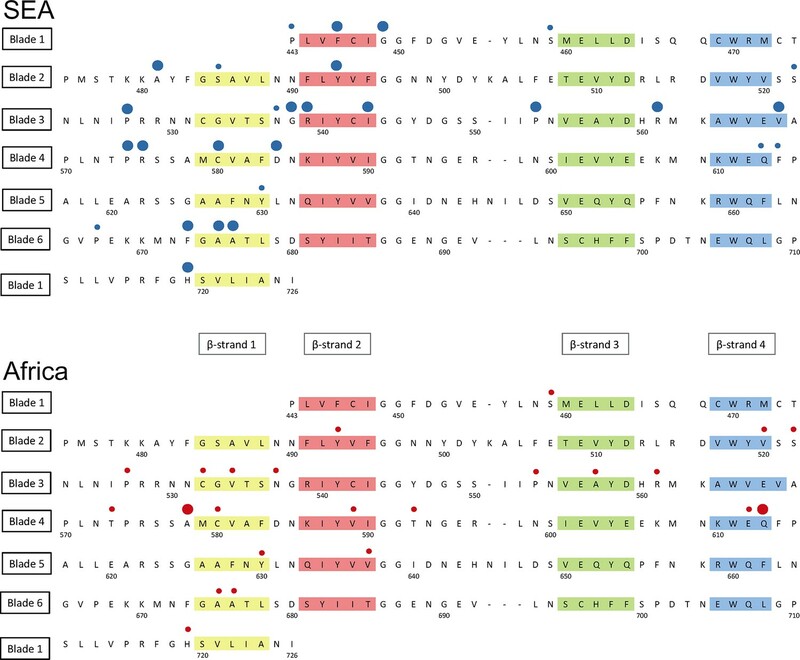 A reconstruction of ancestral alleles from this alignment suggests that P. falciparum accumulated only five conservative amino acid changes in the kelch13 propeller domain since diverging from other species 55 Myr ago (Escalante and Ayala, 1995) (Table 5). Given this extreme level of conservation, non-synonymous polymorphisms may appear surprisingly numerous in the present dataset, both in SEA (n = 34) and in Africa (n = 26). Such elevated numbers may be produced by selection processes; alternatively, they may be present in a large neutrally-evolving population, in which low-frequency variations continually emerge, but can only be detected for a brief span of time before they are removed by genetic drift and/or purifying selection. The question is, then, whether neutral evolution can account for the pattern of kelch13 mutations observed here. Kelch13 propeller domain mutations in different Plasmodium species. 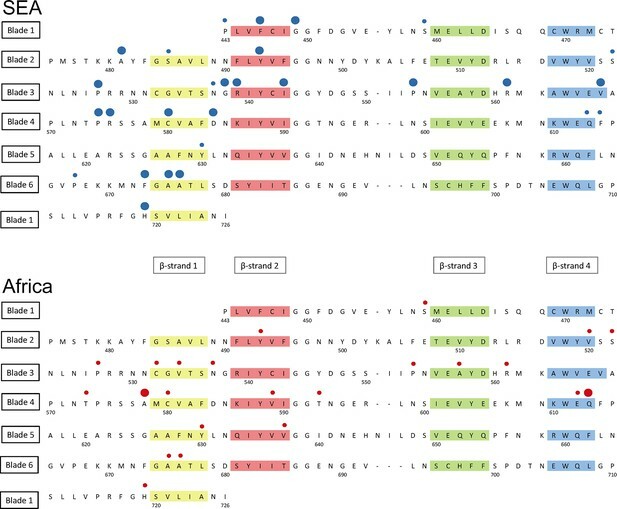 Here we report amino acid allele differences in a multiple sequence alignments of kelch13 homologues for seven species of Plasmodium parasites for which high-quality sequence data were available: P. falciparum (Pf), P. reichenowi (Pr), P. vivax (Pv), P. knowlesi (Pk), P. yoelii (Py), P. berghei (Pb), and P. chabaudi (Pc). The species formed three groups by similarity: Laverania (Pf, Pr), primate Plasmodia (Pv, Pk) and rodent Plasmodia (Py, Pb and Pc). An allele shared by all members of two different groups was identified as a putative ancestral allele. The table shows, for each position where at least one species exhibits a difference from the others: the amino acid position in the Pf kelch13 sequence; the putative ancestral amino acid allele; the alleles in the various species (columns with heading listing multiple species show mutations common to those species); and a substitution score of the mutation, based on a CCF53P62 substitution matrix (see Materials and methods). All substitution scores are ≥0, denoting conservative substitutions. To answer this question, we compared patterns of kelch13 mutations to those in the rest of the P. falciparum genome Supplementary file 1 . Since fewer non-synonymous mutations are expected in more conserved genes, we applied genomic calibration, i.e. we stratified these analyses by evolutionary conservation. Each gene was assigned a conservation score determined from a sequence alignment of the P. falciparum gene with its P. chabaudi homologue, using a substitution matrix corrected for the AT bias in the Pf genome (Brick and Pizzi, 2008). P. chabaudi was chosen since it was the member of the group most differentiated from P. falciparum (rodent plasmodia) with the most complete reference sequence. A genome-wide non-linear negative correlation between gene conservation and N/S ratio is clearly observable; this trend is almost identical in the two populations (Figure 5a). 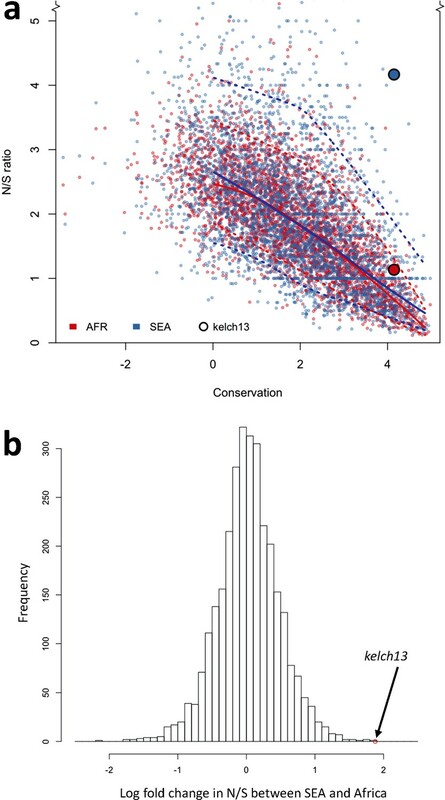 Although kelch13 did not diverge significantly from this relationship in Africa (P = 0.2), its N/S ratio in SEA was the highest observed at its level of conservation, far exceeding the expected ratio (P<0.001). Accordingly, kelch13 showed the most significant difference in N/S ratios between Africa and SEA genome-wide (3.7-fold, P = 2 × 10-4 by Fisher’s exact test, Figure 5b and Supplementary file 1), even compared to other well-known drug resistance genes (Figure 5—figure supplement 1). Such unusually high N/S ratio in SEA parasites is mainly due to an excess of high frequency non-synonymous variations (Figure 5—figure supplement 2), suggesting that multiple independent origins of artemisinin resistance (Miotto et al., 2015; Takala-Harrison et al., 2015) have produced an unusually large number of common non-synonymous mutations. Genome-wide analysis of N/S ratio. (a) For each gene with more than 2 synonymous or non-synonymous SNPs, the N/S ratio in Africa (red points) and in SEA (blue points) are plotted against the conservation score of the gene coding sequence. The kelch13 gene values are represented by larger circles. For each region, a solid line show median values, while dotted lines delimit 95% of the genes at varying levels of conservation. This plot is truncated on the y-axis to show more clearly the bulk of the distribution; the full range is shown in Figure 5—figure supplement 2. (b) Histogram showing the distribution of the ratio of N/S ratios in SEA and Africa, for all genes with ≥5 synonymous and ≥5 non-synonymous SNPs on each region. An arrow shows the placement of kelch13. From this analysis we conclude that the high prevalence of kelch13 non-synonymous variants in SEA is not explainable by neutral evolution, but is consistent with selection of artemisinin-resistance alleles. In Africa, on the other hand, the observed non-synonymous changes appear to constitute a “physiological” level of variation consistent with a population rich in low-frequency alleles. The different kelch13 mutation repertoires in Africa and in SEA raise the question of whether these sets of mutations have different structural and functional properties. While there is high conservation across the whole of the propeller domain, it is unlikely that all possible amino acid changes have the same functional relevance or that they all carry the same fitness cost for parasites. Although direct measures of functional relevance are not yet available, and the exact function of kelch13 is hitherto unknown, we can make statistical comparisons of some properties of the observed changes, in at least two respects. First, assuming that kelch13 function is conserved across Plasmodium species, we can assess the strength of evolutionary constraints at any given position by examining whether amino acid substitutions between species are conservative or radical. Second, given that kelch proteins have been shown in other organisms to play an adapter role, with key binding sites defined by the arrangement of hydrophobic β-strands in the propeller domain (Adams et al., 2000), we can assess changes in hydrophobicity caused by the observed mutations, which may be informative of their functional importance. Detailed mapping against the secondary structure of the propeller domain suggests that the polymorphisms found in SEA parasites occur in different blades, preferentially at positions proximal to the first and second β-strand of the propeller’s blades (Figure 6). This may indicate that these two strands play a role in defining the binding interface to the PI3K protein involved in artemisinin resistance (Mbengue et al., 2015), but this needs to be confirmed by in-depth structural analyses. Structure of the kelch13 propeller domain, showing the position of mutations in Southeast Asia and Africa. The sequence of the kelch13 propeller domain (amino acids 443–726) is organized according to its 6-blade tertiary structure, with the four β-strands characterizing each blade highlighted in colour. Polymorphisms observed in SEA (top panel) and Africa (bottom panel) are shown by circles above the mutated position. Small circles indicate very rare mutations (singletons and doubletons), while larger circles are used for more frequent mutations. 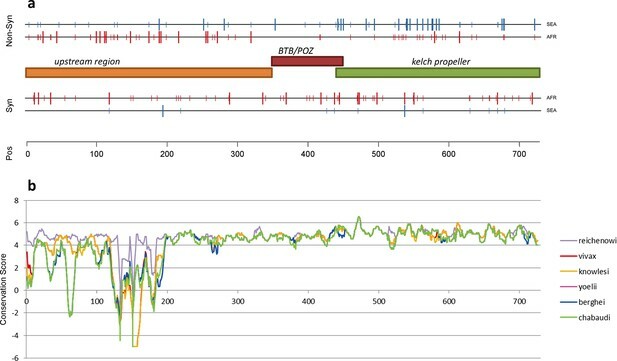 We characterized changes in the propeller domain by a conservation score derived from a substitution matrix specific to AT-rich genomes (Brick and Pizzi, 2008), and assigned a hydrophobicity score to each site, estimated from the Kyte-Doolittle (KD) hydropathicity score (Kyte and Doolittle, 1982). The five putative derived alleles that have become established in the P. falciparum kelch13 propeller domain since its divergence from other Plasmodia are all conservative changes at hydrophilic sites (Figure 6—figure supplement 1a). Common mutations in Africa have characteristics broadly consistent with this conservative history of change (Figure 6—figure supplement 1b and Table 6). Polymorphisms in SEA parasites, on the other hand, show a pattern of changes that are more radical than those in Africa (P = 10–3) and more commonly found at hydrophobic sites (Figure 6—figure supplement 1c and Table 6). Conservation score of KPBD mutations.The table shows, for each non-synonymous KPBD mutation observed in the dataset, the number of samples carrying the mutation in Africa (AFR), in Southeast Asia (SEA), and a substitution score of the mutation, based on a CCF53P62 substitution matrix; lower values indicate more radical substitutions. Mutations observed in Africa tend to have higher conservation score, whereas in SEA mutations tend to be more radical. Taken together, the above results suggest that the propeller domain has long been under very strong evolutionary constraints, and that the number and nature of the changes observed in African parasites is consistent with these constraints, once we discard the abundant rare alleles expected in such a large population. In contrast, mutations in SEA parasites are not only far more numerous than expected, but they produce radical changes that are likely to be important determinants of the binding properties of the kelch13 protein, consistent with recent findings that binding of kelch13 to the PI3K protein is a critical factor in P. falciparum response to artemisinin (Mbengue et al., 2015). A recent study has shown that resistance-causing KPBD mutations are significantly more likely to arise in parasites with a particular genetic background (Miotto et al., 2015). This predisposing genetic background is marked by specific SNP alleles of the genes encoding ferredoxin (fd), apicoplast ribosomal protein S10 (arps10), multidrug resistance protein 2 (mdr2) and chloroquine resistance transporter (crt). Here we extend this analysis, confirming that this particular combination of variants is extremely common in the parts of Southeast Asia where artemisinin resistance is known to be established, and is absent from Africa and other regions sampled here (Table 7). Frequency of the genetic background alleles across the world. Frequency of the four genetic background alleles identified in Miotto et al. (2015) for each geographical region. For each SNP, we show mutation name; chromosome number; nucleotide position; and frequencies of the mutant allele in the various populations. 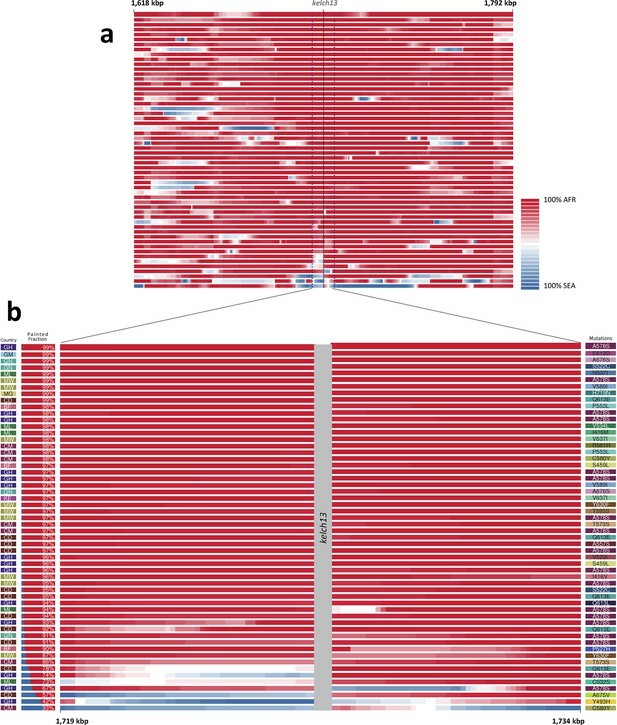 This study demonstrates the value of genomic data in characterising the current epidemic of artemisinin resistance, which is problematic for conventional molecular epidemiology since new resistance-causing mutations are continually emerging on different haplotypic backgrounds. A key problem is to define the geographical origin of KBPD mutations, and we show that this can be solved by using genomic epidemiological data to analyse ancestral relationships between samples, thereby demonstrating that the KPBD mutations observed in Africa are of local origin. Another important question is whether KPBD mutations are under positive selection in Africa, which is difficult to determine by standard haplotype-based methods because so many independent mutations are involved. This question is further complicated by marked geographical variation in normal levels of genetic diversity, i.e. there are many more rare variants in Africa than Southeast Asia, most likely due to the larger population size and other demographic factors (Manske et al., 2012). Here we address this question by comparing kelch13 against other genes in the same samples, a process that we refer to as genomic calibration. We show that for most genes the ratio of non-synonymous to synonymous mutations is relatively constant across geographical regions, despite geographic differences in genetic diversity, and that this ratio is correlated with the level of sequence conservation across different Plasmodium species. When calibrated against other genes with the same level of cross-species conservation, allowing for geographical differences in the overall level of genetic diversity, kelch13 shows a marked excess of non-synonymous substitutions in Southeast Asia, but appears normal in Africa. Moreover, KPBD mutations causing radical amino acid changes at highly conserved positions are found at relatively high frequency in Southeast Asia but remain at very low frequency in Africa. Taken together, these findings indicate that non-synonymous KBPD mutations are undergoing strong evolutionary selection in Southeast Asia, whereas those seen in Africa have originated locally and most likely reflect normal variation. These findings have practical implications for the prevention of artemisinin resistance in Africa, where there is evidently a deep reservoir of low frequency genetic variations that could potentially allow resistance to emerge rapidly as the levels of selective pressure increase. In most parts of Africa, the selective pressure of artemisinin is probably relatively low at present, for several reasons. Artemisinin has been widely used in Southeast Asia for over two decades, whereas its usage in Africa is more recent, and it is estimated that only 20% of infected African children currently have access to frontline treatment ACT medication (World Health Organization, 2014b). Another factor is that people living in regions of high malaria endemicity acquire partial immunity, resulting in asymptomatic infection, so that there is a large reservoir of parasites in Africa that are not exposed to antimalarial drugs because asymptomatic individuals do not seek treatment (Hastings, 2003). The situation could change dramatically as malaria control efforts are intensified, and it will be vital to monitor the effects of major interventions on the emergence of resistance, particularly in African countries that have already achieved relatively low levels of malaria transmission. A key question for the future is whether parasite populations in certain locations possess genetic features that predispose to the emergence of artemisinin resistance, as suggested by the strong association of certain fd, arps10, mdr2 and crt alleles with resistance-causing KPBD mutations in Southeast Asia (Miotto et al., 2015). Another concern is that growing resistance to ACT partner drugs, now emerging in Southeast Asia (Saunders et al., 2014) may spread to Africa, or evolve independently there, and lead to increased selective pressure for artemisinin resistance there. The global spread of resistance to chloroquine and sulfadoxine-pyrimethamine was dominated by hard sweeps of specific haplotypes originating in Southeast Asia, although it is clear that there were also localised emergences (Mita et al., 2009). Although we still know relatively little about the functional properties of different KPBD mutations, it is clear that some are more successful than others, e.g. the C580Y allele has emerged at multiple locations in Southeast Asia and Africa, and a specific C580Y haplotype is approaching fixation in large parts of Western Cambodia (Miotto et al., 2015). The high level of sequence conservation of KPBD across Plasmodium species indicates that mutations in these domains incur fitness costs, and this is supported by the observation that although there have been multiple independent origins of resistance-causing kelch13 mutations, individual kelch13 mutations appear to have limited spread, implying that there is a substantial fitness cost in the absence of sustained drug pressure. The danger is that these fitness costs may be compensated by other genetic variants, either in kelch13 or elsewhere in the genome, and that, as a result of this continuing evolutionary process, parasites in Southeast Asia will progressively acquire higher levels of artemisinin resistance (World Health Organization, 2014a) coupled with strong biological fitness and the ability to propagate across a wide range of vector species. Under these circumstances, the current soft sweep of artemisinin resistance could give way to a pervasive hard sweep with potentially disastrous consequences. These findings demonstrate the utility of applying genomic epidemiology to identify features of parasite demography and evolution that affect how drug resistance spreads. Future strategies to combat resistance will require better understanding of the evolutionary consequences of malaria control interventions, e.g. how the selective advantage of a resistance allele is counterbalanced by its fitness cost under different control regimes and in different geographical settings. It is now possible to approach this problem prospectively, by conducting systematic spatiotemporal sampling and genome sequencing of the parasite population as an integral part of public health interventions to prevent resistance spreading. All samples in this study were derived from blood samples obtained from patients with P. falciparum malaria, collected with informed consent from the patient or a parent or guardian. At each location, sample collection was approved by the appropriate local and institutional ethics committees. The following local and institutional committees that gave ethical approval for the partner studies: Comité d'Éthique, Ministère de la Santé, Bobo-Dioulasso, Burkina Faso; Navrongo Health Research Centre Institutional Review Board, Navrongo, Ghana; Kintampo Health Research Centre Institutional Ethics Committee, Kintampo, Ghana; Noguchi Memorial Institute for Medical Research Institutional Review Committee, University of Ghana, Legon, Ghana; Ghana Health Service Ethical Review Committee, Accra, Ghana; Gambia Government/MRC Joint Ethics Committee, Banjul, The Gambia; Comité d'Ethique National Pour la Recherche en Santé, Guinea; Ethics Committee of Faculté de Médecine, de Pharmacie et d'Odonto-Stomatologie, University of Bamako, Bamako, Mali; Ethical Review Committee, University of Ilorin Teaching Hospital, Ilorin, Nigeria; Institutional Review Board, Faculty of Health Sciences, University of Buea, Cameroon; Comité d’Ethique, Ecole de Santé Publique, Université de Kinshasa, Ministère de l’Enseignement Superieur, Universitaire et Recherche Scientifique, D. R. Congo; Comité National d'Ethique auprès du Ministère de la Santé Publique, Madagascar; Institutional Review Committee, Med Biotech Laboratories, Kampala, Uganda and Uganda National Council for Sciences and Technology (UNCST); College of Medicine Research Ethics Committee, University of Malawi, Blantyre, Malawi; KEMRI National Ethical Review Committee, Kenya; Medical Research Coordinating Committee of the National Institute for Medical Research, Tanzania; Ethical Review Committee, Bangladesh Medical Research Council, Bangladesh; Ethics Committee of the International Centre for Diarrheal Disease Research, Bangladesh; Institutional Ethical Review Committee, Department of Medical Research (Lower Myanmar); Ministry of Health, Government of The Republic of the Union of Myanmar; National Ethics Committee for Health Research, Ministry of Health, Phnom Penh, Cambodia; Ministry of Health National Ethics Committee For Health Research, Laos; Ethics Committee, Faculty of Tropical Medicine, Mahidol University, Bangkok, Thailand; Ethical Committee, Hospital for Tropical Diseases, Ho Chi Minh City, Vietnam; Eijkman Institute Research Ethics Commission, Jakarta, Indonesia; Institutional Review Board, Papua New Guinea Institute of Medical Research, Goroka, Papua New Guinea; Institutional Review Board, International Center for Medical Research and Training, Cali, Colombia; Institutional Review Board, Universidad Nacional de la Amazonia Peruana, Iquitos, Peru; Human Research Ethics Committee of NT Department of Health and Families and Menzies School of Health Research, Darwin, Australia; Institutional Review Board, New York University Medical School, NY, USA; Institutional Review Board, National Institute of Allergy and Infectious Diseases, Bethesda, MD, USA; Institutional Review Board, Walter Reed Army Institute of Research, Washington DC, USA; Ethics Review Committee, World Health Organization, Geneva, Switzerland; Ethics Committee of the Faculty of Medicine, Heidelberg, Germany; Ethics Committee of the Medical University of Vienna; Ethics Committee, London School of Hygiene and Tropical Medicine, London, UK; Oxford Tropical Research Ethics Committee, Oxford, UK. DNA was extracted directly from blood samples taken from patients at admission time, after leukocyte depletion to minimize human DNA. Leukocyte depletion was achieved by CF11 filtration in most samples (Venkatesan et al., 2012), or alternatively by Lymphoprep density gradient centrifugation (Axis‐Shield, Dundee, UK) followed by Plasmodipur filtration (Euro‐Diagnostica, Malmö, Sweden) (Auburn et al., 2011) or by Plasmodipur filtration alone. Genomic DNA was extracted using the QIAamp DNA Blood Midi or Maxi Kit (Qiagen, Hilden, Germany), and quantities of human and Plasmodium DNA were determined by fluorescence analysis using a Qubit instrument (Invitrogen, Carlsbad, California) and multi-species quantitative PCR (Q‐PCR) using the Roche Lightcycler 480 II system, as described previously (Manske et al., 2012). Samples with >50 ng DNA and <80% human DNA contamination were selected for sequencing on the Illumina HiSeq platform following the manufacturer’s standard protocols (Bentley et al., 2008). Paired‐end sequencing reads of length 200–300 bp were obtained, generating approximately 1 Gbp of read data per sample. All short read sequence data have been deposited in the European Nucleotide Archive (http://www.ebi.ac.uk/ena/data/search/?query=plasmodium), and metadata will be released at the time of publication. Polymorphism discovery, quality control and sample genotyping followed a process described elsewhere (Manske et al., 2012). Short sequence reads from 3,411 P. falciparum samples included in the MalariaGEN Plasmodium falciparum Community Project (http://www.malariagen.net/projects/parasite/pf) were aligned against the P. falciparum 3D7 reference sequence V3 (ftp://ftp.sanger.ac.uk/pub/pathogens/Plasmodium/falciparum/3D7/3D7.latest_version/version3/), using the bwa program (Li and Durbin, 2009) (http://bio-bwa.sourceforge.net/) as previously described (Manske et al., 2012), to identify an initial global set of 4,305,957 potential SNPs. This list was then used to guide stringent re-alignment using the SNP-o-matic algorithm (Manske and Kwiatkowski, 2009), to reduce misalignment errors. The stringent alignments were then examined by a series of quality filters, with the aim of removing alignment artefacts and their sources. In particular, the following were removed: a) non-coding SNPs; b) SNPs where polymorphisms have extremely low support (<10 reads in one sample); c) SNPs with more than two alleles, with the exception of loci known to be important for drug resistance, which were manually verified for artifacts; d) SNPs where coverage across samples is lower than the 25th percentile and higher than the 95th percentile of coverage in coding SNPs (these thresholds were determined from artifact analysis); e) SNPs located in regions of relatively low uniqueness (Manske et al., 2012); f) SNPs where heterozygosity levels were found to be inconsistent with the heterozygosity distribution at the SNP’s allele frequency; and g) SNPs where genotype could not be established in at least 70% of the samples. These analyses produced a final list of 935,601 high-quality SNPs in the 14 chromosomes of the nuclear genome, whose genotypes were used for analysis in this study. All samples were genotyped at each high-quality SNP by a single allele, based on the number of reads observed for the two alleles at that position in the sample. At positions with fewer than 5 reads, the genotype was undetermined (no call was made). At all other positions, the sample was determined to be heterozygous if both alleles were each observed in more than 2 reads; otherwise, the sample was called as homozygous for the allele observed in the majority of reads. For the purposes of estimating allele frequencies and genetic distances, a within-sample allele frequency (fw) was also assigned to each valid call. For heterozygous calls, fw was estimated as ratio of non-reference read count to reference read count; homozygous calls were assigned fw = 0 when called with the reference allele, and fw = 1 when called with the non-reference allele. For a given population P, we estimated the non-reference allele frequency (NRAF) at a given SNP as the mean of the within-sample allele frequency (fw) for all samples in P which have a valid genotype at that SNP. The minor allele frequency (MAF) at is the computed as min(NRAF, (1 – NRAF)). A neighbour-joining tree was then produced using the nj implementation in the R ape package. Principal coordinate analysis (PCoA) was performed using the same pairwise distance matrices using the Classical Multidimensional Scaling (MDS) method (Gower, 1966) PCoA is a computationally efficient variant of principal component analysis (PCA) in which a pairwise distance matrix is used as input, rather than a table of genotypes. The matrix was supplied as input to the MDS algorithm, using the R language cmdscale implementation. We analyzed homologous protein sequences of kelch13 genes for seven Plasmodium species for which high-quality sequence data were available: P. falciparum, P. reichenowi, P. vivax, P. knowlesi, P. yoelii, P. berghei, and P. chabaudi. The sequences were retrieved from the OrthoMCL cluster ORTHOMCL894 in GeneDB (http://www.genedb.org/), and a multiple alignment was obtained using ClustalW (Larkin et al., 2007) at default settings. In turn, we considered each pair alignment of P. falciparum with one of the remaining species, assigning a substitution score to each kelch13 amino acid position, derived from the CCF53P62 substitution matrix. Although this matrix was chosen due to its suitability for AT-rich codon biases (Brick and Pizzi, 2008), we found that use of the more commonly used BLOSUM62 matrix (Henikoff and Henikoff, 1992) did not have a significant effect on the results. Finally, each amino acid position was assigned a conservation score for the pair alignment, equal to the mean of the substitution scores in a 9-residue window centered at that position. To reconstruct putative ancestral and derived alleles in the propeller domain, we catalogued all polymorphic positions in the multiple sequence alignment. We organized the seven species into three groups by similarity: Laverania (P. falciparum, P. reichenowi), primate Plasmodia (P. vivax, P. knowlesi) and rodent Plasmodia (P. yoelii, P. berghei, and P. chabaudi), and observed that at each position, only one of the groups presented an allele different from that in the remaining groups. This group-specific allele was labelled as a putative derived allele, and the alternative allele as ancestral. (see Table 5). Rodent species were found to carry the highest number of derived alleles, and therefore deemed to be good comparators for genome-wide conservation scoring. P. chabaudi was selected as a representative species in this group, and used for subsequent comparative analyses. We estimated a gene conservation score for every P. falciparum gene for which a P. chabaudi orthologue sequence could be obtained from PlasmoDB (http://www.plasmodb.org/). The details of the method are described elsewhere (Gardner et al., 2011). Briefly, alignments of orthologous protein sequences were performed using ClustalW (Larkin et al., 2007) at default settings, and each amino acid position was assigned a CCF53P62 substitution score (see above). The gene conservation score assigned was equal to the mean substitution score for all amino acid positions in the gene. Each amino acid position in the kelch13 was assigned a hydrophobicity score, estimated by computing the mean of the Kyte-Doolittle index in a 14-residue window centered at the position, using the protein sequence translated from the 3D7 reference sequence. To reconstruct the probable origin of kelch13 flanking haplotypes in African mutants, we used chromosome painting (Lawson et al., 2012), a method that compares haplotypes in a sample to those in the remaining samples, and estimates probabilities that a genome fragment originates each population, by identifying individuals that share the same haplotype. For all African and SEA samples, we applied chromosome painting across the 250 kbp flanking regions on each side of the kelch13 gene. For each sample, haplotypes surrounding genome loci (chunks) were assigned posterior copying probabilities with respect to all remaining samples (unrestricted painting). We aggregated these probabilities according to the geographical origin of the donor samples, assigning to each chunk a probability that it originates from each of the populations. For each sample, we then estimated the expected fraction of chunks copied from each population. In this analysis, we assumed a mutation rate per base per generation of 3.9-10 (Claessens et al., 2014) and a uniform recombination map. Since the two populations differ substantially in effective recombination rates (Mu et al., 2005), we assumed a conservative recombination rate of 30 kbp/cM. Effective population size was initially set to 10,000 and optimized by 10 iterations of the expectation-maximization procedure (Lawson et al., 2012). To account for the presence of heterozygous genotypes due to mixed infections, we modified the matrix of emission probabilities by introducing a novel parameter (ε, set to 10-8) to represent the probability of emitting a mixed call. We repeated the analysis varying this parameter set, to assess the effects of misspecification, and results were found to be very similar qualitatively (data not shown). Illumina sequence reads have been submitted to the European Nucleotide Archive with study accessions ERP000190 (www.ebi.ac.uk/ena/data/view/ERP000190) and ERP000197 (www.ebi.ac.uk/ena/data/view/ERP000197). ENA accession numbers and metadata for the samples used in this paper can obtained via the MalariaGEN website, which also provides access to genotype calls on individual samples (www.malariagen.net/resource/16). Further details of all SNPs reported in this dataset including their genome coverage, mapping quality and allele frequencies in different populations, together with tools for querying the data, can be explored at www.malariagen.net/apps/pf. Trends in Cell Biology 10:17–24. New England Journal of Medicine 371:411–423. New England Journal of Medicine 361:455–467. Proceedings of the National Academy of Sciences of the United States of America 92:5793–5797. Proceedings of the National Academy of Sciences of the United States of America 89:10915–10919. Journal of Infectious Diseases 211:667–669. The Journal of Infectious Diseases 211:1352–1355. Trends in Ecology & Evolution 28:659–669. Molecular Biology and Evolution 23:1076–1084. New England Journal of Medicine 371:484–485. Journal of Infectious Diseases 211:670–679. Journal of Infectious Diseases 211:680–688. The Lancet Infectious Diseases 13:1043–1049. Thank you for submitting your work entitled "Genomic epidemiology of the current wave of artemisinin resistant malaria" for peer review at eLife. Your submission has been favorably evaluated by Prabhat Jha (Senior Editor) and three reviewers, one of whom is a member of our Board of Reviewing Editors. 3) Resistance mutations in kelch13 likely come at a substantial cost, limiting their spread. In addition, they provide a population genomic characterization of the P. falciparum diversity. 1) The study is currently focused exclusively on kelch13 and lacks comparison to other known resistance loci. While kelch13 is compared to the genome wide distribution of diversity, dN/dS, etc., it should be put into context of other resistance loci. It would be straightforward to repeat some of the analysis done for kelch13 for other loci (e.g. highlight those genes in Figure 5, add trees of haplotypes surrounding these loci in analogy to Figure 2). 2) Data availability: the malariaGEN project hosts a comprehensive website for genomic data. However, in the interest of reproducibility and reusability additional files should be provided. We would like to see metadata for all strains included in this study. Ideally, this metadata include sampling date and location, phenotype information where available, the short read archive identifier. Similarly, the source data for figures, such as tables with dN/dS values for genes in case of Figure 5, should be provided. For follow-up analysis a flat file with the genotypes of all strains at the 935,601 high confidence SNPs and their allele frequencies in the different populations would be useful. Such files should be uploaded on data Dryad, or alternatively, a clear description on how to obtain such data from malariaGEN should be given. 3) Figure 1: a genome wide tree is a bad way to summarize diversity in a sexual population. A projection on the first two principal components could be more useful. Location, isolates with kelch13 mutations, phenotypes could be highlighted by color, symbol, size etc. In addition, genomic differentiation could be summarized by FST or the density of private SNPs, possibly in a sliding window along the genome. kelch13 and other resistance loci should be outliers here. 4) Population genomic characterization: Figure 3 is uninformative. Please show the complete minor allele frequency spectra, possibly on a log-log scale to improve readability at the low frequency end. Panel c is redundant with 5a. In order to interpret Figure 2, estimates of the extent of linkage disequilibrium would be welcome (why not show LD decay surrounding kelch13 and other resistance loci in SEA and Africa and compare to genome wide average). 5) Hydrophobicity and radical substitutions: Given that the function of kelch13 is unknown, the emphasis on hydrophobicity as a score for mutations is not justified. In fact, mutations in SEA are found at hydrophilic and hydrophobic sites alike. The stronger signal seems to come from conservation (but note the outlier Y493H). We suggest focusing on conservation and drop the hydrophobicity discussion unless you provide convincing evidence for a causal role of hydrophobicity changes (otherwise, it could stay as a somewhat speculative supplementary figure). The description of the calculation of the conservation score needs more detail. Why did you use a 9 amino acid window for smoothing? How did you average over multiple pairwise comparisons? While substitution matrices quantify broadly the exchangeability of amino acids, they are often a rather poor guide for site specific mutation effects. Is there a way to assess site specific conservation in a broader alignment than the one used for Table 5? 6) Resistance mutations in Africa: A more detailed analysis is required here. Please point out African strains that carry kelch13 mutations on the tree in Figure 2, show additional trees for different haplotype length, and maybe compare African haplotypes with resistance mutations explicitly to the closest SEA haplotype and the closest African haplotype lacking kelch13 mutations. In Figure 2b, do African isolates that cluster with the SEA ones have special properties (e.g. C580Y mutations)? In order to render the discussion of the resistance mutations observed in Africa more concrete, a supplementary file should be provided that contains their country of origin, any drug phenotype data, whether any were culture adapted, whether these were PCR resequenced to confirm the mutations, whether there were any clinical or parasitological data to indicate that these were associated with delayed clearance rates. 7) How representative is Figure 2b showing imperfect separation between Asia and Africa? How does this depend on the size of the window used for tree building? The two African samples that fall in between the SEA and African clusters should be discussed in greater detail and additional analyses are needed to clarify whether they are admixed. 8) The association of fd, aprs10, mdr2, etc. should be explicitly discussed as correlation rather than causation as no evidence is presented for the latter. Given resource limitation, the case for including these loci in routine surveillance is weak at present. The statement in the Discussion should be toned down. We thank the referees for their helpful comments and interest in these data. Based on their suggestions we have made significant changes to all of the main figures. A key question was the geographical origin of kelch13 mutations found in Africa, and we have gone back to the drawing board and reanalysed this using an entirely new method: although the overall conclusions remain the same, our new approach is less dependent on assumptions and which gives results that are clearer and easier to present. The revised manuscript also has greater clarity about the extensive data resources that underlie this analysis, including open access web application that provides user-friendly tools to explore the properties and regional allele frequencies of all of the >900k SNPs used in this analysis, and to learn about the 31 partner studies and 43 sampling locations that contributed to this consortial project. The three bullet points are a good summary of our main conclusions. However it is a bit of an overstatement to add that we “provide a population genomic characterization of P. falciparum diversity”. Although this paper does contain a lot of population genomic information, it is to provide context for our analysis of the kelch13 locus. For a more comprehensive set of population genomic analyses on these samples, readers are referred to other outputs of the P. falciparum Community Project and its companion Pf3k Project, as outlined below. We intentionally focus on kelch13 because of its scientific interest and practical importance. It would be fascinating to perform detailed analyses on other resistance loci, and then to compare and contrast the findings, but that is beyond the scope of the present paper. Different resistance loci have evolved over different timescales, with different demographic histories and selective processes, and each requires a focused analysis to understand what is going on. For example, detailed characterisation of the pfcrt locus alone would be a major undertaking, given the remarkably complex patterns of diversity that have emerged in different parts of the world following >60 years of selective pressure. With the caveat that such comparisons can be misleading if taken out of context, in the revised version we show N/S ratios for other major resistance loci: pfcrt, pfmdr1, pfdhfr and pfdhps. It can be seen that both pfcrt and kelch13 have high N/S ratios in Southeast Asia, but readers need to be aware that very different processes are driving this signal for the two loci – the former is associated with a hard sweep and extreme loss of diversity, whereas the latter is associated with a multitude of resistant haplotypes. Because of these caveats, we propose that this new figure is supplementary to Figure 5, retaining the main focus of the paper on the kelch13 evolutionary pattern. We now provide additional supporting data, as summarised below, and the revised manuscript describes more clearly how to access these and other data that we have already released. i. We have created a resource page at http://www.malariagen.net/resource/16 to accompany this paper, which provides links to the data release plus other information about the project. This takes the reader to a permanent URL listing all the online resources relating to this study. The revised manuscript gives links to these web resources in two places: in the introduction and in a new section entitled 'Data access and URLs'. In addition we provide links to specific resources where appropriate in the Results and Methods sections. iii. We have released genotype calls on individual samples (i.e. 935,601 SNPs genotyped in 3,394 samples). These are made available via the Wellcome Trust Sanger Institute public ftp site and can be accessed from http://www.malariagen.net/content/p-falciparum-community-project-jan-2016-data-release. We are unable to openly release the sequence data from Indonesia due to national export restrictions. This involves only 17 samples, i.e. less than 1% of the total. iv. We provide an Excel spreadsheet containing the source data for Figures 3 and 5. For each P. falciparum gene analyzed, this table lists: the ortholog gene in P. chabaudi, the conservation score, the count of non-synonymous and synonymous mutation in Africa and Southeast Asia, the log fold change and the associated p-value. We propose that this is released as a supplementary file to the paper. v. The sequence read data have been deposited in the European Nucleotide Archive (ENA). At the time of publication we will release a sample metadata file on www.malariagen.net/resource/16. Each sample will be identified by its ENA accession number, country of origin, year of collection, and by partner study that contributed the sample. vi. Many of these samples are also part of the Pf3k Project whose goal is to undertake a comprehensive analysis of genome variation in 3,000 parasite samples representing the major malaria endemic regions of the world, and to make all of these data openly available. The Pf3k web application provides open access variant call data for 2,375 (68%) of the 3,488 samples included in the present study (www.malariagen.net/apps/pf3k) and these data will be continually improved as new analytical methods become available. To put the above data resources in context, the present manuscript is one output of a larger Community Project with a dual purpose: (1) to provide malaria research groups with access to genome sequencing on their samples and to enable them to incorporate these data into their own analyses; (2) to combine data across multiple partner studies to perform global analyses such as the current manuscript (http://www.malariagen.net/projects/parasite/pf). One of the major challenges is to develop an equitable data access policy that protects the legitimate interests of individual partner studies while encouraging global analyses and openly accessible data. The data resources described above represent our best efforts to balance these different considerations while continually looking for ways to increase the quality and quantity of data that is made openly available to the scientific community. Unfortunately it is impossible to summarize the diversity of this population in a single graphic. Both neighbor-joining trees and PCA plots have limitations, and the most pragmatic approach is to use a variety of methods. 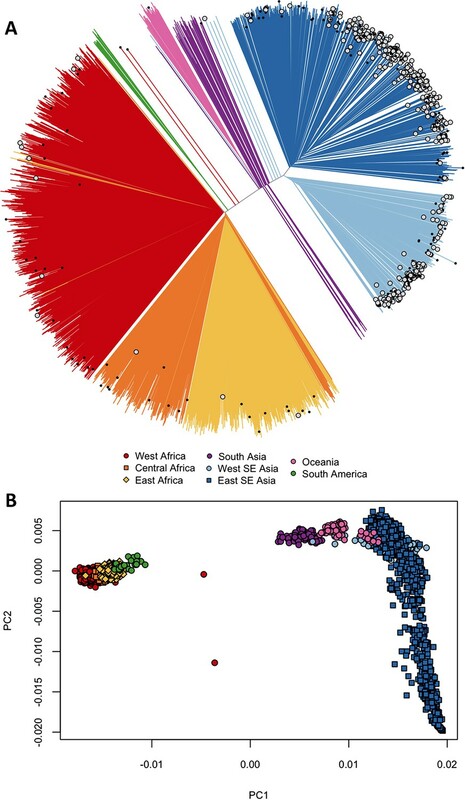 In Figure 1—figure supplement 1 it can be seen that PC1 separates Africa and South America from the rest of the world, whereas PC2 is driven by recent founder events in Southeast Asia (see Miotto et al. 2013 for a fuller discussion). These founder effects can also be seen on the NJ tree but are much less pronounced, and we therefore felt that the NJ tree was more suitable for Figure 1, as it provides a more intuitive visualization for the average reader. However we do not feel strongly about this and are happy to include both NJT and PCA as main display items. As suggested we have also included a sliding-window FST analysis which shows that the differentiation between Africa and SE Asia is fairly evenly distributed across the genome. At the pfcrt locus, for example, FST between Africa and SE Asia is relatively low, possibly reflecting the spread of chloroquine resistance haplotypes from SE Asia to Africa. Around the kelch13 locus there is a much stronger signal but closer inspection reveals that this is not due to kelch13 mutant haplotypes (which are diverse and present in only ~30% of SE Asian samples) but to nearby alleles that are close to fixation in SE Asia and presumably antedate the kelch13 soft sweep (see, for example, www.malariagen.net/apps/pf). Thus the results of sliding-window FST analysis are not as easy to interpret as the reviewer implies, and we would suggest not including this figure. 4) Population genomic characterization: Figure 3 is uninformative. Please show the complete minor allele frequency spectra, possibly on a log-log scale to improve readability at the low frequency end. We have replaced Figure 3a with a more detailed plot of the minor allele frequency spectra. We use a log-linear scale to highlight the large number of rare alleles in the African population. Panel c is redundant with 5a. These are the same data but presented somewhat differently in different contexts to assist the narrative. We are happy to make 3c a supplementary figure if the editor wishes. In order to interpret Figure 2, estimates of the extent of linkage disequilibrium would be welcome (why not show LD decay surrounding kelch13 and other resistance loci in SEA and Africa and compare to genome wide average). Thanks for this perceptive comment. Genome-wide levels of LD are known to differ between Africa and Southeast Asia (Manske et al.2012), and these differences are accentuated by founder effects associated with artemisinin resistance (Miotto et al. 2013). As a result of this comment and other considerations, we decided to replace Figure 2 with a new method of analysis that does not assume a specific haplotype length and should therefore be more robust to variations in LD. This is described in more detail in comment 6. 5) Hydrophobicity and radical substitutions: Given that the function of kelch13 is unknown, the emphasis on hydrophobicity as a score for mutations is not justified. In fact, mutations in SEA are found at hydrophilic and hydrophobic sites alike. The stronger signal seems to come from conservation (but note the outlier Y493H). We suggest focusing on conservation and drop the hydrophobicity discussion unless you provide convincing evidence for a causal role of hydrophobicity changes (otherwise, it could stay as a somewhat speculative supplementary figure). We have revised the main text to provide a clearer rationale of the potential importance of hydrophobicity. Mbengue et al. (Nature 2015) have shown that kelch13 binds to PI3K (a target of artemisinin), marking it for degradation. Kelch binding sites in general are determined by the arrangement of hydrophobic β-strands in the propeller domain. It is therefore interesting that radical mutations at hydrophobic sites are relatively common in Southeast Asia compared to Africa, or compared to variations seen between different Plasmodium species. However we are not arguing that hydrophilic changes are unimportant, and to avoid undue emphasis on hydrophobicity, we have moved what was formerly Figure 6 to become a supplementary figure. In the new Figure 6 (formerly Figure 7) we have created two panels to show more clearly the different structural distribution of mutations in SEA and Africa. We have also removed 7b which highlighted the periodic pattern of hydrophobicity. The description of the calculation of the conservation score needs more detail. Why did you use a 9 amino acid window for smoothing? How did you average over multiple pairwise comparisons? We have applied the method described by Gardner et al. (BMC Evolutionary Biology 2011), which includes a 9-amino acid smoothing window. This did not involve averaging over multiple comparisons: as stated in Results: "Each gene was assigned a conservation score determined from a sequence alignment of the P. falciparum gene with its P. chabaudi homologue.” The problem with using multiple species in the genome-wide analysis is that it greatly reduces the number of genes that can be analysed due to lack of complete reference sequences for most species. In the revised manuscript we clarify this point: “P. chabaudi was chosen since it was the member of the group most differentiated from P. falciparum (rodent plasmodia) with the most complete reference sequence." However for kelch13 there are available data from multiple species, as shown in revised Figure 4b. While substitution matrices quantify broadly the exchangeability of amino acids, they are often a rather poor guide for site specific mutation effects. Is there a way to assess site specific conservation in a broader alignment than the one used for Table 5? Table 5 summarizes the conservation data that we can garner from alignments that capture ~50 Mya of parasite evolution. A broader alignment would require analysis of non-Plasmodium species with very low levels of sequence identity, which we think is beyond the scope of the present work. 6) Resistance mutations in Africa: A more detailed analysis is required here. Please point out African strains that carry kelch13 mutations on the tree in Figure 2, show additional trees for different haplotype length, and maybe compare African haplotypes with resistance mutations explicitly to the closest SEA haplotype and the closest African haplotype lacking kelch13 mutations. In Figure 2b, do African isolates that cluster with the SEA ones have special properties (e.g. C580Y mutations)? In order to render the discussion of the resistance mutations observed in Africa more concrete, a supplementary file should be provided that contains their country of origin, any drug phenotype data, whether any were culture adapted, whether these were PCR resequenced to confirm the mutations, whether there were any clinical or parasitological data to indicate that these were associated with delayed clearance rates. 7) How representative is Figure 2b showing imperfect separation between Asia and Africa? How does this depend on the size of the window used for tree building? The two African samples that fall in between the SEA and African clusters should be discussed in greater detail and additional analyses are needed to clarify whether they are admixed. These are insightful comments, which along with other considerations have caused us to rethink this part of our analysis. Any flanking haplotype method that relies on a specific window size (such as the trees we showed in the previous version of Figure 2) is problematic because too-large a window may mask signals of recombination close to the gene of interest, whereas too-small a window will result in lower genetic distances making the tree topology unreliable. A further problem in choosing window size (as highlighted in Comment 4) is that LD decay is difficult to estimate in SEA. We now use an entirely different approach to determine the most likely geographic origin of kelch13 mutations, and Figure 2 has been revised accordingly. We have conducted a new analysis using chromosome painting, which provides a probabilistic framework to identify shared haplotypes and analyse haplotype origin. As shown in the revised version of Figure 2, based on analysis of both kelch13 flanking regions, there are two African samples that could plausibly have common origin with Asian samples, while another four are similar to Asian samples in one of the flanking regions. The revised manuscript has a more detailed discussion of these findings. The two African samples with Asian features in the region of kelch13 represent only a small minority of the African samples observed to have kelch13 mutations, and they were collected in two different countries. They are clearly separated from other African samples when analysed at the level of the whole genome (Figure 1) and to complicate matters they are also multiclonal infections. Therefore they could possibly be mixtures of African and Asian parasites, either real or due to laboratory contamination, and the present data do not allow us to confidently rule out either of these possibilities. Taken together, these findings offer no clear evidence that kelch13 mutations have spread from Asia to Africa, but this is clearly something that will need to be kept under close surveillance in the future. In comment 2 we clarify the available metadata which includes country of origin and year of sampling. The dataset assembled for this consortial analysis described here does not include any clinical, parasitological or phenotypic data. The samples were contributed by multiple partner studies pursuing specific research questions independently of the consortial analysis, as outlined in the accompanying web application (www.malariagen.net/apps/pf/). The vast majority of samples were leukocyte-depleted venous blood, sequenced without culture adaptation. We used stringent quality filters to minimize the likelihood of false positive mutations, an approach which is at least as accurate as PCR resequencing as we have reported elsewhere (Manske et al.2012). Note that many African kelch13 mutations are found in multiclonal infections, which can be problematic for conventional PCR resequencing. 8) The association of fd, aprs10, mdr2, etc., should be explicitly discussed as correlation rather than causation as no evidence is presented for the latter. Given resource limitation, the case for including these loci in routine surveillance is weak at present. The statement in the Discussion should be toned down. MGENPfCP, RA, OM, DPK, Conception and design, Analysis and interpretation of data, Drafting or revising the article, Approved the submitted manuscript; DMe, ED, SC, MK, MS, Developed and implemented sample processing and sequencing library preparation methods, Drafting or revising the article, Approved the submitted manuscript; AAN, CA, LAE, VA, TA, EA, SA, VB, AB, MFB, TB, PCB, DJC, AC, NPD, AD, CDo, AMD, CDr, PD, DFE, TGE, RMF, MAF, CIF, TTH, AH, MI, DI, PL, CL, JMa, KM, MMay, PM, VM, OAM, JMo, IM, MPK, PNN, FN, RN, AN, HO, AO, MO, J-BO, APPP, CP, RNP, SP, MR, PR, LR, DS, AS, PS, STH, T-NNT, VT, FV, JW, NJW, HY, GAA, SB, OB, KC, Carried out clinical studies and/or laboratory work to obtain parasite samples, Drafting or revising the article, Approved the submitted manuscript; CM, DJ, MMan, JS, Development and management of data production pipelines, Drafting or revising the article, Approved the submitted manuscript; CJW, JAG, IS, AM, RDP, PV, BJ, Developed analysis, software tools and methods, Drafting or revising the article, Approved the submitted manuscript; VJC, RG, DMu, CH, GM, KAR, BM, JCR, Contributed to study design and management, Drafting or revising the article, Approved the submitted manuscript. GM: Reviewing editor, eLife. The other authors declare that no competing interests exist. This study was conducted by the MalariaGEN Plasmodium falciparum Community Project, and was made possible by clinical parasite samples contributed by partner studies, whose investigators are represented in the author list. RA and OM contributed equally. In addition, the authors would like to thank the following individuals, who contributed to partner studies or to the MalariaGEN Resource Centre, making this study possible: James Abugri, Nicholas Amoako, Steven M Kiara, John Okombo, Rogelin Raherinjafy, Seheno Razanatsiorimalala, Hongying Jiang, Xin-zhuan Su. The sequencing, analysis, informatics and management of the Community Project are supported by the Wellcome Trust through Sanger Institute core funding (098051) and a Strategic Award (090770/Z/09/Z) and by the MRC Centre for Genomics and Global Health which is jointly funded by the Medical Research Council and the Department for International Development (DFID) (G0600718; M006212). AEB and IM acknowledge the Victorian State Government Operational Infrastructure Support and Australian Government NHMRC IRIISS.